A 141,459 sq ft warehouse unit in Swadlincote, Derbyshire, has been acquired by Jenkins. The specialist warehousing and logistics company has agreed a five-year lease on the unit, called Tetron 141, with landlord Aberdeen Standard Investments. The rent is undisclosed. CBRE advised Jenkins on the letting. JLL and Knight Frank acted on behalf of the landlord. 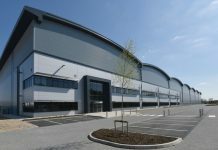 Tetron 141 is a modern Grade A specification industrial unit comprising 132,865 sq ft of warehouse space and 8,594 sq ft of office accommodation, plus 95 car parking spaces. Located on William Nadin Way, an established warehousing and logistics hub, Tetron 141’s neighbours include Bison, Clipper Logistics, Roger Bullivant, Sandvik and TNT. Melissa Wase-Rogers and Craig Herrick from CBRE’s Midlands industrial and logistics team advised Jenkins. Melissa, a director in the team, said: “The East Midlands Industrial market has remained strong throughout 2018, with 9.8 million sq ft of space (buildings over 100,000 sq ft) let during the year.